Unfortunately, Fuego has closed its doors. When I first heard about Fuego Barbecue and Grill, curiosity sparked within me. There is a decent Brazilian/Mexican restaurant in Bandung. 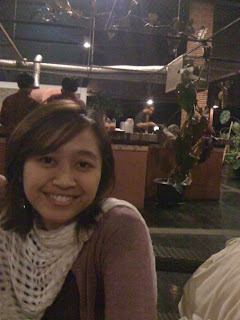 The restaurant is located in the mountain part of Bandung overlooking the city. Just like any other part of the city, the road leads to the restaurant is incredibly crowded, especially weekends, but the restaurant gave us a nice first impression. It is beautifully designed with wooden furniture. The grill is located in the centre where people can see the chef grilling our dinner. It gave us a cosy and spacious feeling with little noise. For starters, we ordered Cajun Salad and Cheddar Stix. 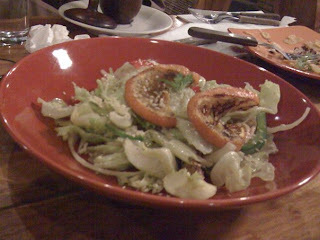 Although not decorated nicely, the salad gave us a spicy Brazilian feel to it. They even put unpeeled, grilled slices of orange. The Cheddar Stix was awesome! Deep fried into golden brown of perfection, 5 stix were laid on top of a bed of vegetables. They were accompanied by spicy (and tasty) Brazilian sauce. 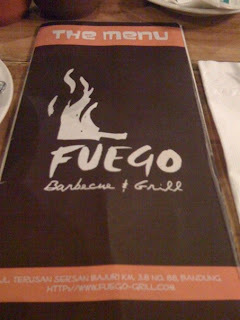 They have a range of Brazilian as well as Indonesian-styled BBQ menu. Unfortunately the one that I chose (first item on the menu! ), American Back Ribs, was sold out. So I ordered their Chef’s suggested Steak, Chimichurri Beef. I highly anticipated the Steak since Chimichurri is THE Brazilian sauce. However it didn’t taste or look like the Chimichurri I’ve ever had. 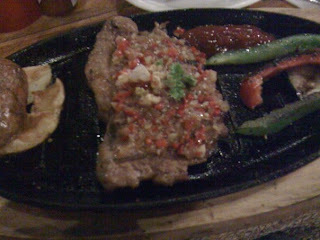 The sauce looked like a pile of sliced chilli and garlic with some oil poured all over my steak. It was nice, garlic-y and spicy, but it was different. I had a taste on Rosemary Beef and Honey Glazed Ribs. It took forever to prepare, the minced beef on a Rosemary stick was not to my liking. The rosemary overpowered the beef, thus it was too much fragrance. I loved its unique presentation and idea. Honey glazed ribs was by far the best meal of the night. The ribs were grilled perfectly. 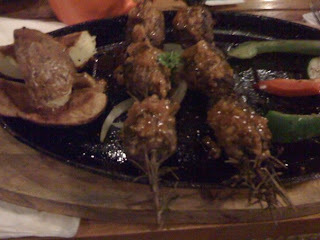 It had strong BBQ taste, yet the meat was still very tender and juicy. For dessert we ordered Apple Fritters and Chocolate Pizza. 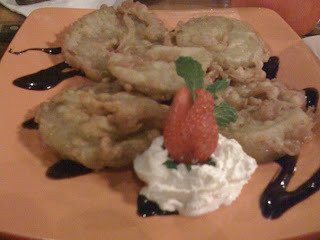 The slices of Apple were deep fried with a chocolate-decorated plate and a side of whipped cream and strawberry. The apple was a bit too sour for me. The filling was nice. Layered of chocolate and fruits, topped with Parmesan cheese was beautiful to end the night with. 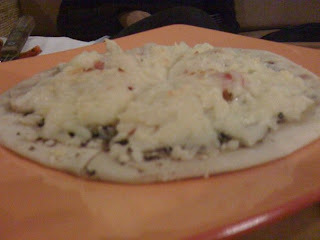 It was only spoiled by the fact that the pizza base was undercooked. It still had the flour-y taste on it. 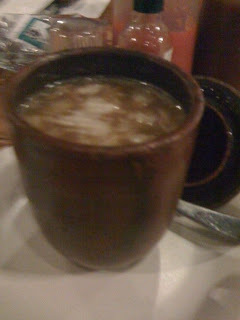 As with most restaurant in Bandung, they have traditional drinks on their menu. I ordered Bajigur on this occasion. Bajigur is a hot ginger drink with slices of coconut. It was the perfect drink for rainy or cold weather. Just like Malang, Bandung is the place to be for Jakarta people to spend their weekend away. However, unlike Malang, the city roads were poorly maintained and traffic can get really ugly, with bikes and public transports seemingly ignoring the traffic rules. If you want to get the idea of Bandung, I would suggest you to drive around the city after 1 AM (no kidding! ), or you’ll be stuck in the traffic. Despite their traffic nightmare, the city itself gave us a glimpse of Indonesian history and the people are incredibly creative and musical. The food… Wow! Highly imaginative with combination never been seen before, but sometimes it can be devastatingly horrid. I am Brazilian and never heard anything about chimichurri being THE Brazilian sauce. We usually eat meat accompanied by a vinaigrette sauce (vinagrete) and is very different from the chimichurri sauce typically used in Argentina and Uruguay. 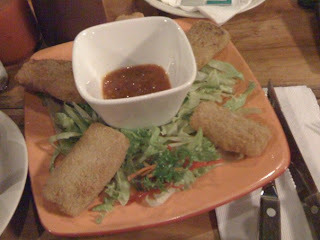 There was a little adaptation to the sauce used in Brazilian restaurants in Indonesia and Australia. 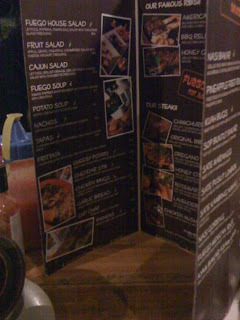 As you can see in my other review (Churrasco restaurant in Sydney ) – http://allaboutfoodblog.com/churrasco-brazilian-style-bbq/ – They have 3 different sauces: Chimichurri, Farofa, and Vinagrette. I assumed that they were a traditional sauce in Brazilian restaurant.